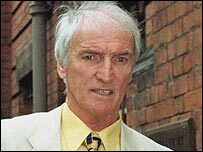 Former Manchester United goalkeeper Harry Gregg has remembered the late Derek Dougan as an unbelievable character and a gifted footballer. Gregg was in the Northern Ireland team when Dougan made his international debut during the 1958 World Cup finals in Sweden. Dougan, who died suddenly on 24 June, went on to win 43 caps and played for English clubs like Woverhampton Wanderers, Aston Villa and Blackburn Rovers. "Doog was very strong in his opinions but we should also remember he was a gifted centre-forward, as they were called in those days," said Gregg, a survivor of the Munich air crash. "Derek always stood his corner and, as far as he was concerned, he was always correct. "I think maybe his career suffered a bit because of his strong opinions. "Derek was someone was spoke out on behalf of players. "I remember going with top players to a meeting at the White City in Manchester and Derek standing up in the body of the hall arguing with Jimmy Hill and the committee, saying what should be done. "But he was also a very gifted player. You expect a big man like Derek to be good in the air but he was also very good with his feet - an exceptionally intelligent centre-forward. "Derek was one of the 17 players we had at the 1958 World Cup but he only got one match. "You see, he was only 20 then and I think the tournament came too early in his career. "But later on he proved what a gifted player he was."